Andean bears love to play with cameras! At least that’s what scientists from the Wildlife Conservation Society (WCS) recently learned after collecting images from a set of remote camera traps. The cameras were placed within Bolivia’s Apolobamba National Natural Area of Integrated Management and captured a series of stop-action images of a group of Andean bears, also known as spectacled bears, sniffing, biting, and banging the cameras. The camera traps were positioned at perfect standing height for passing bears and apparently the temptation to take a smack at such an object was too much for the bears. The images show the curious Andean bears in their repeated attempts to destroy the cameras, until one lone bear remains with each and does not stop until they are knocked from their original posts. Andean bears are classified as Vulnerable by the IUCN Red List and are threatened by poaching, habitat fragmentation, and habitat loss for agriculture, road expansion, mining, and oil exploration. WCS scientists are working to conserve the bears and will use the images to better understand Andean bear behavior, distribution, and population size within the park. The bears are Latin America’s only remaining bear species, though grizzlies once roamed throughout northern Mexico. However, a Mexican grizzly hasn’t been seen for several decades – many believe the last one was shot in 1960 – and is now considered extinct. It seems safe to say that the Andean bears enjoyed their camera-destroying antics, as they do appear to be playing! Above all, it makes for an entertaining (and cute) stop-action video. To see the Andean bears play with the cameras, click here. 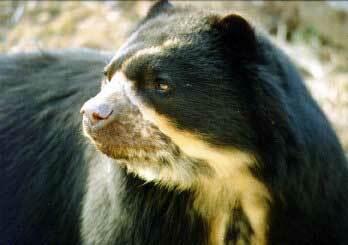 Learn more about the Andean, or spectacled bear at the Great Bear Foundation’s bear species page here.